It is the capital of Czech Republic and is well known for its amazing architecture, bridges and the medieval Astronomical Clock. Once you are here, shouldn’t miss out on the below places ! 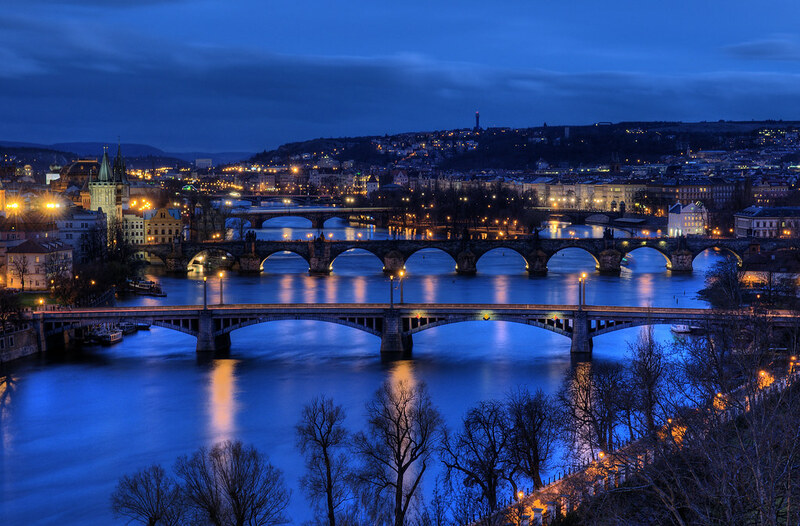 Its is one of Europe’s biggest and most beautiful urban spaces and the most significant square of historical Prague. The square is walkable and is filled with lots of shops, food stands and restaurants. Walk around the square and Explore ! Under the Old Town Hall, you’ll find a series of catacombs worth exploring. They were the first level of the medieval houses that used to be in the square. Now, they are an exhibit (enter through the tourism office) showcasing medieval life. This castle has amazing architecture and provides a great view of the city. You have to trek a bit to reach here but its worth it. Well preserved and simply beautiful despite its wartime residents. You will sure love the Fantastic views of the city from up high. The engineering and resiliency are credits to the Czech people and their leaders. The history of this bridge is surely worth re-reading. Its a long bridge with lots going on with artists,musicians gifts and lots more.The bridge itself is a beautiful thing with statues on both sides every so often.The views from the bridge alone are worth a visit. This cathedral is located on the hill in the Castle complex and is an excellent example of Gothic Architecture The Cathedral dominates the hilltop and is visible from most any point in Prague. The big attraction is the silver tomb of St John which is really spectacular. You need to hike to get up to this tower and would need to pay the admission fee to climb the tower. The view from the top of the well lit Prague especially the areas around Prague Castle and then the Vltava river looks absolutely stunning at night. The tower is away from the crowds and in a bit of gardens and greenery, so surely worth it just for the walk. The equestrian bronze statue of St. Wenceslas is a symbol of the city. This square is a photo opportunities and often presented in books. The square has been the lieu of numerous events. This wide open boulevard is an interesting place to spend an evening. The area is mostly pedestrian and on both sides of the street you will find lots of up market stores, restaurants and hotels. During summer the place is full of tourists, street food kiosks and street performers too. At one end of the boulevard is a big statue of St. Wenceslas and the National Museum and the other end is bordering old town. The National Museum at the top end of Wenceslas Square is a museum. If you like history, you can visit inside. Otherwise, just take a stroll outside and click some pictures ! This palace is a splendid piece of architecture. Exterior of the palace is well maintained and the mix of Gothic and renaissance style architecture looks very evocative. The main room is really wide and provides a sensation of grandeur. The balcony will allow you to take a nice picture of the town. Beautiful work of art with hidden symbolism and intricate details. The “show” at each hour is not very amazing compared to modern standards, but if you consider that the clock was made in the 15th century, it is a marvel. While the hourly chime that people line up for is anticlimactic, the detail and artistry of the clock make it one of the most beautiful in Europe. Definitely worth checking out and admiring this work of art! A popular daytrip destination from Prague, Kutna Hora offers spectacular faded grandeur without the capital’s madding crowds. Saint Barbara’s cathedral and the eerie Kostnice bone church, decorated with disconcerting sculptures of the bones of plague victims, are main attractions. This impressive Gothic building is one of the many symbols of Prague. Although you can climb inside it for a fee, you can appreciate its beauty and significance from street level. The building is located at the east entrance to Charles Bridge and is best viewed during the day as it is not externally illuminated at night. It was once a gate into town, then used to store powder. If you are looking to do something different. The underground tours is a must try. It’s scary and the city gave the perfect setting for a super spooky tour. Prague Underground Tours runs an underground tour of the medieval houses in the city center. There are many catacombs in Prague, and this tour, though short, provides detailed history about medieval Prague. You can also go for the Franz Kafka Museum, if you want to know more about the author Franz Kafka. The museum hosts a number of first edition Kafka books as well as displays original letters, diaries and drawings created by Kafka. Walk around Petrín Park, Visit the John Lennon Wall and relax on the waterfront. So, When are you planning to Visit Prague ? Subscribe us on our website or Connect with us on Facebook and Instagram to get updates of our upcoming blogs. Next 20 World’s Amazing Secret Swimming Holes !